Richardson’s Favorite Junk Removal Crew! The amazing residents and businesses of Richardson, are a smart and a savvy bunch. They only count on and trust one junk removal company to take care off all their junk and debris removal needs. They don’t bother with other companies that aren’t going to meet their needs or take care of them. Who’s the junk removal company Richardson uses? Yep, you guessed it. The Stand Up Guys Junk Removal Crew. You don’t just become ‘Richardson’s Favorite’ in anything by luck. It takes years of dedication and love for the community. The Stand Up Guys Junk Removal Crew didn’t build up this incredibly strong rapport with the people of Richardson over night. No, it took time and effort, but we earned it all the same. 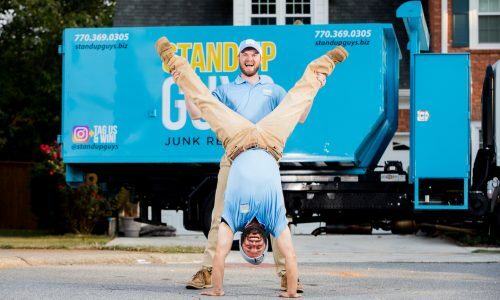 The Stand Up Guys earned the title of ‘Richardson’s Favorite Junk Removal Crew‘ with our content efforts towards perfection in customer service and customer care. We ensure that all of our Richardson customers are more than just satisfied when they use our service, we make sure they are WOW’d by us! Another big reason that Richardson has fallen in love with The Stand Up Guys is simply because of our service. I mean we will pretty much take anything and everything you need. From an old broken couch to a garage or attic full of junk, we’ll handle it for you. Heck, even if you have a backyard filled with debris from your last yard clean up, we’ll help with that too. There is no junk job to big or too small for The Stand Up Guys. Richardson is a vastly growing city in the northern suburbs of Dallas, TX. Pretty rapid growth actually, the city alone has grown from 99,000 residents to well over 108,000 in just the last 4 years. There are a lot of awesome perks to Richardson and that’s exactly why people are moving here from all over. Richardson is home to the University of Texas of Dallas and the Telecom Corridor. The Telecom Corridor is brings a large amount of telecommunication companies to the area, which in turn creates more jobs for the people of Richardson and helps the local economy. Richardson was a fairly small town until the 1950’s. After World War II Richardson saw massive growth across the board. From 1950 to 1972 the city went from 1,500 people to well over 55,000! Tons of businesses began to headquarter out of Richardson, including Texas Instruments in the 50’s, and the economy stayed steady on the rise. The growth continued, both residential and commercially well in to the 1990’s when the population hit 90,000 people. Richardson finally changed it’s stance on alcohol in the mid 90s and went from a ‘dry city’ to normal. The people of Richardson rejoiced. In 2006 Richardson was ranked 15th on Money Magazines ‘Best Places to Live’ and I must say, we agree. There are a lot of great things about Richardson, one of which is that you have access to the greatest junk removal crew on the map. Richardson LOVES The Stand Up Guys Junk Removal Crew.